Created by Congress in April 1798, the Department of the Navy has its earliest roots in the Continental navy formed in 1775 by General George Washington to defend the American colonies from British attack. In the absence of a national navy, the American colonies relied extensively on privateers (a private ship authorized by government to attack enemy ships) to harass British shipping. The British held superiority at sea prior to the formation of the Continental navy, threatening the disruption of colonial trade and the destruction of coastal settlements. On October 3, 1775, the Continental Congress (the governing body consisting of delegates from each of the 13 American colonies, and later from the 13 states) received information about two unarmed English brigs, departing England bound for Quebec, which were carrying munitions for British troops. While waiting for Congress to authorize a navy, George Washington took matters into his own hands by commanding three schooners to cruise off the coast of Massachusetts and intercept enemy supply lines. Massachusetts sailors on army duty manned these makeshift warships. In a letter read to Congress on October 13, 1775, General Washington notified them of his actions and urged them to form a navy. Congress voted to properly equip sailing vessels in order to prevent enemy vessels from bringing supplies to the British Army in America. In addition, Congress established a naval committee responsible for purchasing, outfitting, manning and operating the first ships of the new navy. The committee also drafted subsequent naval legislation and prepared rules and regulations to govern the organization. The first American squadron was launched on February 18, 1776. The size of the Continental navy peaked in 1777 with a total of 31 ships. In 1779, an American naval squadron under the command of John Paul Jones took the fight to Great Britain. In a celebrated battle, Jones at the helm of the Bon Homme Richard engaged and defeated the British warship H.M.S. Serapis off the English coast. During the battle when asked by the British captain if he were prepared to surrender, Jones replied with the immortal words, "I have not yet begun to fight." In 1783, the signing of the Treaty of Paris provided the United States with independence from Britain, however, freedom at sea was yet to be accomplished. Congress disbanded the Continental navy at the end of the Revolutionary War and the United States functioned without a navy until 1794. Without armed ships or the protection of Great Britain, North African pirates frequently victimized American merchant vessels in the Mediterranean Sea during this time. In order to safely explore new markets in which to conduct trade, Congress reestablished a national navy authorizing the construction of six new vessels on March 27, 1794. The congressional act stipulated that construction would cease if peace with Algiers was achieved. An agreement was reached early in 1796, prior to the ships' completion, yet Congress approved the finishing of three frigates. 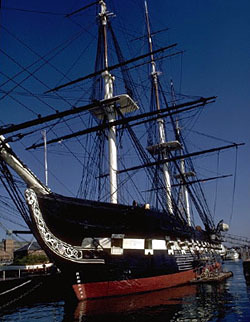 The USS United States, the USS Constellation and the USS Constitution were launched in 1797. As tensions with France prompted greater public support for a strong navy, officials from the Department of War, the Department of Treasury and Congress pressed for the creation of a separate naval department solely responsible for naval affairs. On April 30, 1798, President John Adams signed a congressional act establishing the Department of the Navy. By the end of 1798, the navy owned 14 completed vessels and had more under construction. 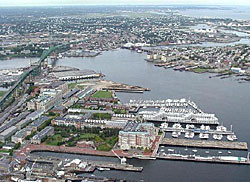 Naval shipyards, such as Philadelphia Naval Shipyard, Washington Navy Yard, Boston Naval Shipyard (Charlestown Navy Yard) and New York Navy Yard, sprung up around the turn of the century along important rivers and on the coastlines of major American cities to support increased ship production and to prepare existing ships for combat. Following the American Revolution, the British refused to withdraw from American territory along the Great Lakes and continued attacking American merchant ships, which led to the onset of the War of 1812. 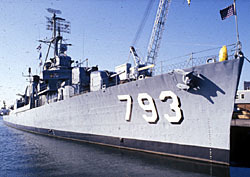 The U.S. Navy had 17 ships at this time, compared to the 600 ships of the British fleet. The USS Constitution, constructed at Edmund Hartt's shipyard in Boston, participated in a battle with the British vessel Guerriere on August 19, 1812, and emerged victorious after approximately one-half hour. In December 1812, the Constitution defeated the British warship H.M.S. Java in a noted battle off the coast of Brazil. Though unable to prevent British assaults on Washington, Baltimore and New Orleans, the U.S. Navy was more successful on the Great Lakes. The United States secured control of Lake Erie and then defeated the British on Lake Champlain, which led to the war's conclusion with the signing of the Treaty of Ghent on December 24, 1814. After achieving such success during the War of 1812, Congress encouraged the expansion of the naval fleet and bestowed upon the U.S. Navy responsibility for protecting burgeoning overseas commerce. 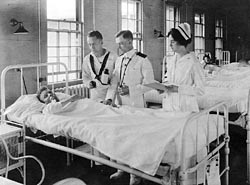 Officials also constructed naval hospitals in or near key cities to better serve the growing navy. The Boston Naval Hospital opened in 1836 as one of the first three hospitals authorized specifically for naval personnel. Recognizing the need for formal training of naval officers, in 1845, Secretary of the Navy George Bancroft founded the "Naval School" at Annapolis, Maryland. In 1850, it became known as the U.S. Naval Academy. John Paul Jones, the "father of the American navy," is buried in the Naval Academy's chapel. Following the start of the Civil War in 1861, few expected naval warfare to constitute an important part of the national conflict. The Union navy possessed 42 ships, most of which were deployed at sea at the start of the war, and the Confederates initially had no navy. The North immediately organized a blockade to stop all traffic and communications to the South and began an emergency shipbuilding program. The South acquired ships from Britain, captured Union vessels and began a shipbuilding program of their own. When the Civil War ended in a Union victory in 1865, the United States possessed a total of 671 ships making it the largest navy in the world. Following the war, Congressional funding for new ship construction ceased until the early 1890s, when three new battleships were commissioned allowing the U.S. Navy to compete on equal footing with European naval powers. While floating in Havana Harbor in 1898 to protect American citizens in Cuba, one of the new battleships, the USS Maine, mysteriously blew up killing all 250 crew members and spawning the Spanish-American War. The subsequent American victory resulted in Spain ceding Puerto Rico, Guam and the Philippines to the United States, gave the United States guardianship over Cuba, and generally established the United States as a world power. In order to protect this new empire, the U.S. Navy worked to modernize its fleet by building submarines, destroyers, airplanes and more battleships. The new and improved fleet was tested in 1917 when the United States entered World War I. Following an Allied victory in 1918, arms-limitation treaties such as the Washington Treaty and the Five-Power Treaty forced the United States to reduce both the number and the size of its ships. The importance of aviation increased in naval operations during the post-World War I era. The Navy developed aircraft carriers, radar technology and better weaponry for protection from air attacks. The United States entered World War II in 1941 after the Japanese attacked Pearl Harbor. 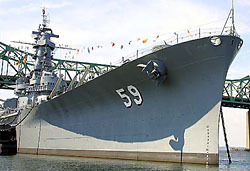 Many naval vessels included in this Maritime History of Massachusetts travel itinerary and exhibited in Massachusetts today were built during World War II and actively participated in combat, such as the USS Massachusetts, the USS Lionfish and the USS Cassin Young. PT Boat 617 and PT Boat 796 were both built towards the end of the war, yet neither served in the naval fleet until after Japan surrendered aboard the battleship Missouri on September 2, 1945, concluding World War II. The Gearing-class destroyer USS Joseph P. Kennedy, Jr. built at the Bethlehem Steel Corporation Shipyard in Quincy, Massachusetts, was commissioned on December 15, 1945, and played a significant role in the Korean War, the Cuban Missile Blockade and America's space program.